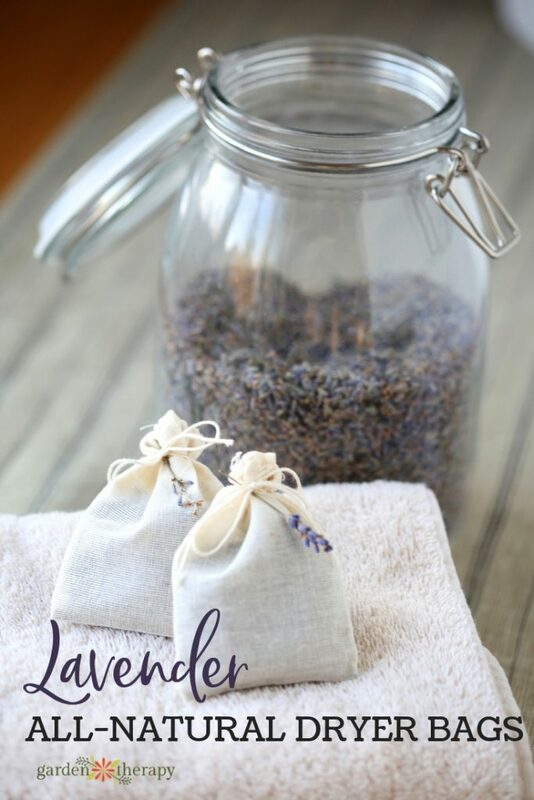 Lavender dryer bags are a natural way to freshen laundry and a good use for dried lavender harvested from your garden. Lavender is a lightly floral but clean-smelling fragrance that adds a little lift to your laundry. Dryer bags can be filled with the dried flower buds and used many times over before needing to be replaced. 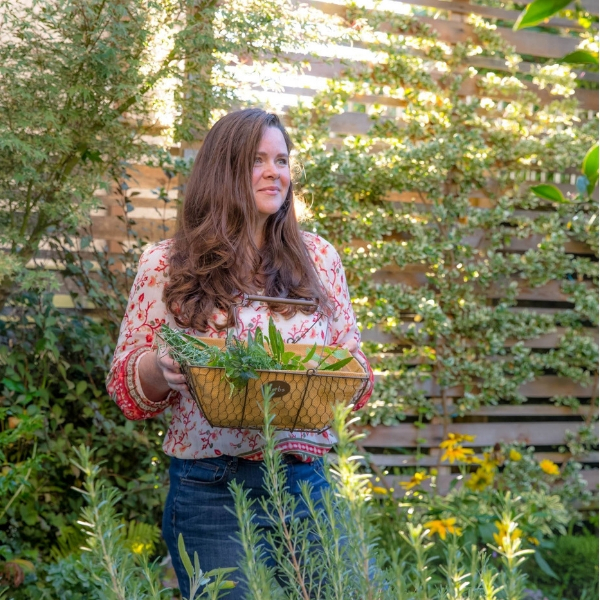 Adding in a few essential oils will give your laundry a fresh and natural garden scent that makes you feel wonderful as you cozy into your freshly washed bed clothes or pull on a sweet-smelling shirt. Four years ago I swapped out chemical-laden dryer sheets for sachets of lavender and I’m so much happier with how my clothes feel and smell. Of course, the best option is to line-dry your laundry in the sunshine and let the garden perfume it that way. There is no better way to remove odors from laundry than to dry the fabric in the sun! Unfortunately, you can’t line dry outdoors all year in many places. In rainy Vancouver, I would have to wait for months for my clothes to dry. In those winter months, I turn to the dryer but bring some of the garden into the laundry room with me. 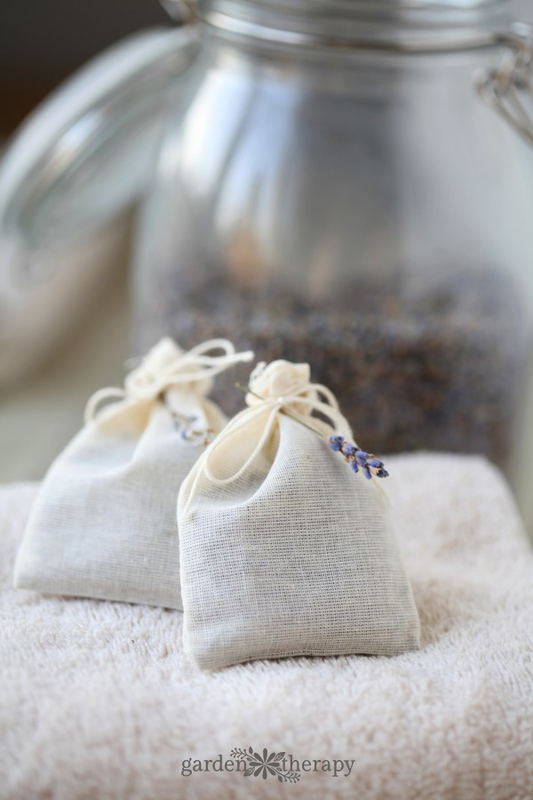 Lavender dryer bags are made simply from lavender scooped into small drawstring muslin bags like these. These bags are typically sold as bouquet garni bags for adding herbs to soups, stocks, or stews. If you don’t grow your own lavender, you can purchase it in bulk online. When you have filled the bag with lavender, tie it tightly in a few knots and then wrap the string around the top and tie again. This will ensure that it will not come apart in the dryer. Toss a bag in with the laundry to add a light fragrance. Each dryer bag will last for ten loads in the dryer. To add more fragrance to your fabrics, you can also add a few drops of essential oils onto the muslin before each cycle in the dryer. 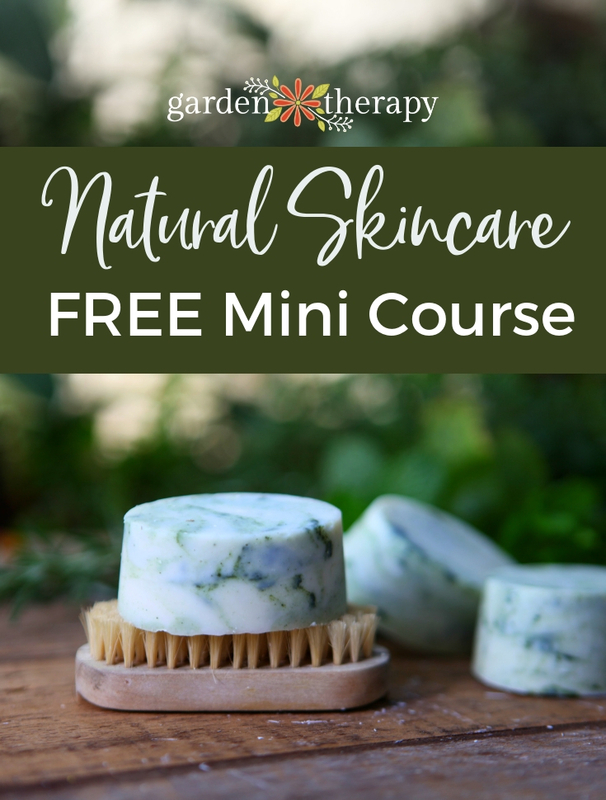 Of course, you will want to add some lavender essential oil, but you can also add some cheery sweet orange essential oil, bright and earthy lemongrass essential oil, or deodorizing rosemary essential oil. Lavender dryer bags will also make a great gift! Present a set of 6 bags in a vintage jar wrapped with ribbon. The sealed jar will help keep the bags fresh when you store them in your laundry room. During what part of the dryer cycle do we put the bags into the dryer? And how long should they be in there? Thank you. Hi! I put them in when I add the laundry and leave them in the whole time. Instead of double tying the drawstring, could I sew along the top to seal the lavender in? Hi Meghan, absolutely! I reuse the bags after by refilling the lavender, which you could also do by unstitching them and sewing them back up. I really like this idea as the knots can be hard to get out. That’s a great idea. But I wonder how to spread the lavander odour to the sheets, etc. in case I do not use the mechanic dryer? Then the only way is lavander spray? I was just wondering is this fresh lavender or dried? Does this reduce static or just provide fragrance? Just fragrance. I add vinegar into the wash cycle for static. I just fill up the fabric softener cup with vinegar and add a few drops of rosemary and grapefruit essential oils. It works like a dream!